Congratulations to "Donna", the winner of Toni's giveaway. Thank you to all who participated! My latest release, THE KILLING GAME, is one of those books that just wouldn't leave me alone. It’s full of action and adventure, from embassy bombings to poaching, Cold War murder to deadly avalanches. But at the heart of the story is a good old fashioned romance, where love--hopefully--conquers all. My heroine, Dr. Axelle Dehn, is a wildlife biologist on a mission to save snow leopards. She's the sort of woman who lets nothing stand in her way. Not politics, not geography, not impossible odds. Her research area is a small panhandle off the north east corner of Afghanistan--the Wakhan Valley. Not only is it inaccessible due to war and conflict, it is encased in snow and ice for seven months of the year. The Wakhan Corridor formed part of the Ancient Silk Road but was cut off and isolated when Mao Tse Tung shut down the Chinese border. The Wakhan as we know it today was created as a buffer zone to reduce the risk of war between the two great imperial powers of Russia and Great Britain during the 1800s--part of the Great Game. Which made the Wakhan the perfect setting for a spy story with secrets reaching back into the paranoid years of the Cold War era. When someone starts killing Axelle’s snow leopards she rushes back to the Wakhan to stop them, not realizing the world's most notorious terrorist is operating there. Our hero, British SAS trooper Ty Dempsey, is someone equally tough and determined. As the son of an IRA terrorist, Dempsey renounced his family’s values of hatred and intolerance when his sister was caught in a deadly bomb set by his father. Now Dempsey dedicates his life to saving people because he couldn't save his sister. But the vow he made to Queen and country won't keep Axelle safe and he's forced to choose between the woman he loves and the country he’s dedicated his life to. ​​​Wildlife biologist Axelle Dehn isn’t about to let anyone harm her endangered snow leopards—not the poacher intent on killing them, nor the soldier who wants to use them as bait. But Axelle is unknowingly entangled in a conflict that stretches back three decades, a conflict that could spark a war between two of the world’s great nations. ​British SAS soldier, Ty Dempsey, is on a mission to hunt down an infamous Russian terrorist in a remote region of Afghanistan. Dempsey hasn’t failed a mission yet, but when Axelle is kidnapped by the Russian, he is forced to choose between duty and his heart. He risks everything to save the determined, prickly woman he’s fallen for, but in doing so sparks a deadly series of events that threaten to expose the most successful spy in history. A spy who will destroy anyone who gets in his way. And in print from Amazon. A former marine biologist, Toni Anderson has traveled the world with her work. She was born and raised in rural Shropshire, England, and, after living in five different countries, she finally settled down in the Canadian prairies with her husband and two children. Combining her love of travel with her love of romantic suspense, Anderson writes stories based in some of the places she has been fortunate to visit. Check out her books on her website, Amazon Author Page, or sign up for her mailing list to hear about new releases. 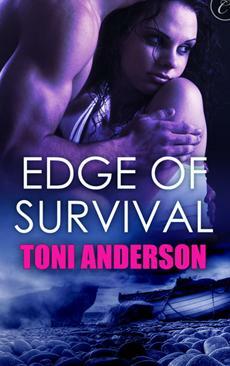 I’ll give away a copy of EDGE OF SURVIVAL which also features a British SAS hero, to one lucky commenter. So tell me—what’s the setting of your favorite Romantic Suspense story? Giveaway ends 11:59pm EST April 18th. Please supply your email in the post. You may use spaces or full text for security. (ex. jsmith at gmail dot com) If you do not wish to supply your email, or have trouble posting, please email maureen@justromanticsuspense.com with a subject title of JRS GIVEAWAY to be entered in the current giveaway. Barbara Freethy has written some of my favorite romantic suspenses like "Played" and "Golden Lies" and both take place in San Francisco, which happens to be one of my favorite cities. Barbara Freethy writes wonderful stories! And San Fransisco looks like such a fascinating place. I've never been to the south, but I loved all Tami Hoag's Louisiana set books. Would love to get down there one day! I love the Ocean, so anywhere near it is great. I especially like the Bay Area. Oh I have read a wonderful wide variety of places in romantic suspense books... not sure if I could pick a fav... through the pages of books I have visited many cities and towns, countries and exotic locales... I will say that I have read quite a few books placed in New Orleans that have given me an interesting taste of what it is actually like... Thanks for sharing with us today Toni! Thanks, Colleen :) New Orleans looks like an amazing place to visit. I'd love to set a book there! I love variety so I'm really happy with any location. Most mentioned cities but out in the middle of nowhere or old homes can be suspensful for me. One of my favorites is a Nora Roberts story set in Alaska. I love that book too! Nora is fabulous. Debra, I love JRS too :) Thanks for commenting. I don't have a favorite setting - each place adds its own flavor to the story. I dont have a specific setting, although its always fun when they are set in a place I have lived or know well. But I really like them in city locations. THE KILLING GAME does look like a wild ride. I don't have an absolute favorite when it comes to setting. Mary--it's an adventure :) I hope readers like it!! Thanks for commenting.